The re-engineering of Australia. | The best climate change laboratory in the world – well, it could be. Massachusetts Institute of Technology has undertaken a very interesting initiative called Colab. The intention is to engage interested individual people from all over the world in thinking of ideas for ameliorating the effects of climate change. Currently there are 25 topics on different types of activity, in each of which contributors are competing for a cash prize (currently $10,000) with the possibility to attend a conference in USA and address the congregation of scientists, businessmen, politicians, educators and others. If anyone has any ideas in this area, join up as a member and await the next set of contests (the current one ends on 13th June 2015). Sign up to make comments (helpful ones, hopefully) or if you have appropriate material already developed, select the most appropriate contest and join in. Now, here is an update on my proposal. I did not get into the semi-final, which is not surprising as I think my proposal was a bit off topic. However, the judges were quite complimentary and suggested that I move my proposal to a general work area where I can improve it with a view to entering another contest or (given that my proposal describes a tool) join up with other contestants where my proposal may enhance theirs. The really good thing is that I have made contact with some really great people both in the USA and here in Australia who are all being very helpful and supportive. My next task is to set up the maths for identifying the BEU (Basic Earth Unit) where a given set of GPS co-ordinates will reside and to clarify the numerical relationships between BEUs and any XEUs (Extended Earth Units) they reside in. Watch this space! I came across this post in a CSIRO newsletter. It contains a number of short videos (some with transcripts) and the offer of an excellent free manual entitled “The Biodiversity Book”. I hope to get some great advice from it on biodiversity aspects in my blog. Please download and read! When talking about the fate of biodiversity it’s easy to get bogged down in doom and gloom—we know that it’s in decline, that human populations and demand for resources continue to grow, and therefore the pressure we’re putting on other species is increasing, and that big gaps remain in our understanding of the biodiversity that’s out there. 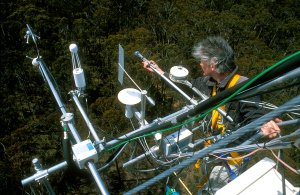 Australia is developing a vast capacity for monitoring the natural environment through the Terrestrial Ecosystem Research Network. Image: Gregory Heath. But there are solutions. Since the concept of biodiversity first emerged in the 1980s, the science dedicated to understanding our natural systems has come a long way. With the emergence of new technologies it has become possible to find out far more about the species we share the planet with, and we can do it with far more efficiency. Once again I must apologise for my lack of contribution to this blog in recent months. Retirees such as myself tend to glory in the apparently limitless time available to pursue interests or make oneself socially useful. One signs up for just about every opportunity to work for the public good (as one sees it), only to find that the incremental demands on one’s time curtail the ability to engage in one’s personal interests. Fortunately, I can say that quite a lot of my activity has enabled me to gather a substantial amount of information that is relevant to this blog. For instance, I was fortunate in being invited to be an observer at a series of conferences called Melbourne 3.0 which took place over a period of three months in 2013. The overall topic was the future role and significance of IT in various areas of government and business activity. As well as having access to all of the bulletins and communiqués produced throughout the event, I was able to communicate with some people (by telephone and email) whose interests were aligned with my own to a greater or lesser degree. Some of the ideas which I gained from this and other events or by studying material published in various online journals, blog sites, library books and the print press will be discussed in this post (and hopefully, future ones too). The main thesis of my blog is that we must make the most effective use of our land mass area to support the maximum number of people, protect our indigenous flora and fauna and extract the raw materials that we need in the most efficient and environmentally sensitive way that we can. To this end, we need to examine the natural characteristics of every piece of land on the continent with a view to optimizing its usage and I have suggested that a 1 km. sq. grid, defined by GPS co-ordinates, be set up. Each cell (which I have called a Basic Land Unit, or BLU) will be populated in the first instance with data obtained from satellite imagery, after which it will be placed in the public domain, where organisations and people may contribute their own information or use the entire database to develop proposals for research, development, production, regeneration and the like. The intention is to identify hotspots already suitable for various land usages or as candidates for modification or regeneration so that they may become more valuable hotspots. A more detailed discussion can be found in the earlier posts Land Usage Mapping., Some Database Considerations. and Core Data Considerations. Once we have identified these hotspots, the next thing to be considered is how to access them, modify them (if necessary) and develop them. Bear in mind that the hotspots will appear on the map as a series of random dots and access paths will be developed by connecting dots (usually sites for settlement or some commercial/agricultural activity in the first instance). The selection of dots to be connected for any particular route largely depends upon the economics (i.e. costs versus benefits of the project) but may also depend upon something called the Public Good, where a public benefit can be derived which will be worth the cost of construction and/or operation, but offers little, if any, monetary payback. 3. A NOTE ON RAILWAY ECONOMICS. The economics of the construction and operation of railways is a very complex matter. At one extreme, one has the railway as the gateway to a large undeveloped area as in nineteenth-century USA or Africa. A myriad of business opportunities raised by the provision of the railway almost guarantees the returns necessary to at least meet the construction costs with the possibility of decent profits for some time to come. At the other extreme, the so-called Very Fast Trains or VFTs are designed to provide specific services, connecting capital cities with other capital cities or with substantial regional centres. Their role is essentially to expand or improve on existing services or travel options, relieving stresses on housing and other types of infrastructure such as air travel. Their success depends almost entirely on the degree of uptake of the services offered. As I pointed out in my previous post, where there are substantial gaps between fast train services, slower services can be interspersed, if facilities can be provided for them to exit the main line at the appropriate time and location to let the following fast train go through. The returns offered by the additional traffic could improve the profitability of a VFT project, but there are some offsetting issues which must be addressed. For instance, the required superelevation of the tracks on curves increases with speed, so that slower trains are more vulnerable to derailment or even overturning on bends. However, I have seen pictures of a narrow-gauge railway where the rail cross-section was an inverted L shape. The main wheels rode on the upper surface of the horizontal part and outriggers with small wheels rode on the underside of the same part, in effect hooking the train to the track. Then there is the matter of points and crossings to be considered. Grooves in the rails must be provided for the flanges of the wheels to pass through and it is debatable whether VFTs can traverse these features safely without loss of speed. This is not usually an issue where VFTs alone use the line, because points and crossings usually occur close to the terminals where the trains are already slowing down. Moderately fast trains (e.g. up to about 200 kph) may offer the same possibilities of alternating slow and fast traffic, but without the need for specially designed rails or points and their adoption will be assumed for the remainder of this post. Another concept which can increase the usage of the elevated railway is what I like to call the Night Zone. This is the period between the arrival of the last train of the day and the departure of the first train of the next day. Because of the standardised cross-sectional profile of the elevated railway, a train carrying materials stored in shipping containers can stop at any point along the railway and offload or pick up the containers on demand. People accompanying the containers can also disembark and descend to the ground via temporary extensible ladders. Because trains operating in the Zone are one-off commitments, there is no specific need for them to observe the up and down track rules. This allows for some flexibility in the methods of offloading at the delivery site. A train may consist of one or more three-wagon sets, where the first and third wagons hold the containers, while the middle one holds a crane which can unload the containers, depositing them on the same side of the structure as the train. This method is necessary where separate trains are using both tracks within the same Zone access period. If there is only one train, or all trains are travelling in the same direction, one or more cranes may be despatched on the unused line, following or meeting the trains and unloading each one in turn on the side opposite to the train. These are only two of many possibilities, but the point to note here is that the standardisation of the equipment and processes for construction and transport provides a useful backdrop against which specialised equipment can be designed and operated in order to recover or develop hotspots. The availability of such equipment could be a driver in the selection of hotspots to include in any given railway route, as could the availability of any other services such as water and power carried on the railway structure itself. The conventional view of rural railway services is that they will carry people between settlements, country stations and major cities and agricultural produce or raw minerals to centres from where they were grown or extracted to centres where they can be sold or shipped overseas. If these were the sole drivers for the construction of railways extending over the long distances envisaged, then it is possible that construction would not be worthwhile, even with substantial government subsidies. It is therefore necessary to look for activities which can be classified as being for the Public Good and therefore attract financial grants and support from organisations which engage in them. I suggest that Public Good activities can be broadly divided into three categories; transformative, restorative and productive. Transformative activities will change a tract of land from one ecological type to another type which bears no relationship to it (at least not in the recent past). One obvious candidate is a sandy or rocky desert, but one could also consider man-made tracts such as the abandoned sites of mining operations. If the tracts are to support the growth of vegetation, then the need for the importation of soil may or may not render the activity uneconomic, even as a Public Good. There are other possibilities, however. A major one is water storage. There are surprisingly few appropriate sites for large dams in Australia, but there are opportunities for many smaller dams, some of which can be covered with concrete structures carrying enough topsoil to support various types of agricultural activity, as described in my post Infrastructure 3. Water. The water may be conducted to or from the tract by a pipe carried on the railway structure or by simply creating channels to places which would benefit from the water, such as farms or wetlands. Regenerative activities are, as the name implies, those which take a damaged or modified tract of land and restore it to full health or the type of ecology that it formerly enjoyed. There is a degree of overlap with transformative activities here, but the matter is discussed in this section because the technologies available to make the changes are the same. There is an underlying principle in land regeneration, which I came across while reading about the work of Robert Vincin, One of his major achievements was the regeneration of many thousands of hectares of land in Mongolia, which was slowly declining into a desert. The thesis that underlaid his work is that most plants can be apportioned to one of two categories, related to the way they deal with carbon. Plants classified as C4 take carbon out of the atmosphere and store it in the soil. Plants classified as C3 feed on the carbon already present in the soil. It happens that many native Australian plants are C4, which can be used to regenerate lands intended for biodiversity protection or simply to enrich the soil with carbon, which can be viewed either as a capture exercise to reduce carbon dioxide in the atmosphere or as a preparation for agricultural production. The plants that provide most of our vegetarian food are, as one might expect from the previous discussion, of the C3 family. Productive activities may include immediate agricultural operations such as the harvesting of wild fruit and vegetables or preparatory work for other agricultural or non-agricultural activities. For instance, a nearby rock outcrop might be a good site for a quarry to provide aggregate for a road which will pass under or run alongside the railway, eventually departing to service a settlement some distance away from the railway. At this point, we have a complete audit of the Australian landmass from which we have selected a number (hopefully a large number!) of hotspots which are candidates for protection, improvement, agricultural activity or settlement. One or more elevated railways connect selected hotspots. Out-of-hours trains can service these hotspots on demand, so that there is uninhibited access for people, materials and equipment. The next question is – how do we use all of these resources efficiently? Given the nature of traffic in the Night Zone, it is probably not feasible to have staff getting on a train in the early hours of the morning, doing a day’s work on site, then coming home on another train early in the evening. A better model is the fly-in, fly-out arrangement used on large-scale mining and construction projects. Temporary housing is already available in the form of containers, which can be transported to site at the beginning of the project and retrieved again after work has been completed. Except perhaps for the construction of buildings for settlements and dams for water retention, most of the on-site work is comparatively spasmodic, only requiring physical access for activities such as planting, checking for progress and quality, and harvesting. It is not a very efficient use of human resources to have people travelling to a distant site simply to see what progress is being made. When I began this blog, I thought that remote monitoring on a commercial scale would be a few decades into the future. I have been quite astonished to find that such processes are not only being used now, but are already at a commercial level, so it seems to be a reasonable assumption that much site management could be carried out using video cameras, sensing equipment, tracking monitors and so forth. Control equipment could, if necessary, be suspended from the railway structure. During the 2013 Melbourne 3.0 event, I was able to make contact with Mr. Stewart McConachy, National Sales and Marketing Manager for Austracker, a company manufacturing tracking devices based generally on GPS and RFID technologies. He described a new product called Aglive which he expected to have on the market in the following October. It would offer some quite comprehensive services to farmers in both the production and business areas. I have had no response to emails asking for details of the product, nor have I been able to log in to the Aglive system, as one requires agribusiness credentials to be accepted. However, on the home page, there is a list of features which does provide sufficient information for the present discussion. These fall into three groups. The PIC (Property Identification Code) is a master key which connects all items of data relevant to the property under remote management. One would imagine that it would contain a master GPS location (probably the farmhouse or office), which is analogous to the usage of the south-eastern corner of a BLU as an identifier. A Geofence is a set of GPS locations or RFIDs which define an area, which in the case of a farm is a field or paddock. This is analogous to the lake structure in the landmass database. The reason why it is called a geofence is that it is managed by software which registers the movement of electronic tags across it and depending upon the information in any tag (e.g. an RFID), can initiate appropriate action to control or log the movements. The second group describes the contents of the area being monitored. Stock Description And Quantity, as the name implies, is a set of statistics usually describing the numbers of particular types of livestock on a property. However, it could also describe an area (perhaps a geofence) where a particular crop has been planted. In the context of the current discussion, it could include robots and drones, together with the descriptions of the items or materials they are monitoring. Biosecurity details describe any cautionary information relevant to the export or import of the contents being monitored. The third group describes the history of the contents being monitored. Stock details And Transfers generally refer to movements of stock or produce in and out of the area being monitored. In the context of the current discussion, it could include movements around the area, changes or growth of vegetation and so forth. Destination and agent details describe a transfer of control to someone outside the management or investigatory team. Date and time stamps apply a sequence to multiple items of information collected. While the data held in the Aglive product is, for obvious reasons, related to commercial activity, the general structural similarity to the database proposed in this block does suggest that, if sufficient demand were forthcoming, the software model could be adapted to record and analyse other operations designed to optimise the usage of any particular BLU. Because the database is in the public domain, it is very likely that multiple organisations or activist groups will propose alternative usages for the BLU, so the next step is to analyse the competing bodies of data. I have come across a company called Agworld which apparently offers application software and storage which can analyse and report on agribusiness data from many different sources. From what I can see on its web site, it does not automatically read data on the ground (though there is a suggestion that it can process such data picked up by independent contractors). It provides apps which allow farmers and technical people to record the data that they see and measure and immediately forward it to Agworld. Again, depending upon the demand, it would seem to be quite within Agworlds areas of expertise, to examine multiple sets of data pertaining to a particular site and provide a ranking of its value for specific usages. This is not to say that the highest value for a usage must always be accepted. Where the highest optimal ranking of a BLU is one step above that for a number of surrounding BLUs, this ranking may be rejected in favour of the lower one for reasons of practicality, such as ease of access, intensity of effort required to bring the usage to fruition and so forth. The important thing is that any rating must be based on rational argument and not on political or social preferences. This post has not been at all comprehensive in its coverage of modern technologies and their potential role in analysing and modifying BLUs. There is simply too much development going on. Its only intention is to draw attention to some of the opportunities for handling measurements and analysis remotely. Aglive and Agworld are only exemplars of the widespread innovation taking place. The ABC program Landline is very useful as a showcase for ideas which have already hit the street (so to speak). Although this blog began life looking at developments which may take many decades to make a really comprehensive difference, these examples of current inventiveness suggest that we are closer than we think to being able to transform Australia (and indeed other countries with arid climates and desert landscapes) to cope with rapidly increasing populations and food shortages. This blog has been dormant for quite a while (for which I apologise) but I seem to have become involved in quite an array of activities, all of which have made demands on my time. However, some of them were relevant to the topics discussed here. On one occasion, I visited a very interesting (and for me, quite nostalgic) web site called RailPage Australia (http://www.railpage.com.au/) where I was able to discuss some of the transport infrastructure ideas I described earlier in this blog (see Infrastructure 2. Modes Of Access) with some very knowledgeable people in the railways field. I described the structural model expecting some discussion on the technical aspects of construction, but the most useful insights came from some of the respondents who basically asked two questions. The first was “How do you propose to build such a structure, particularly in very remote areas?”. The second was “Why do you want to construct railways in this form, rather than the traditional one?”. These are valid and important questions and this post will hopefully provide acceptable answers to them and also to other implied questions. 1. WHAT WILL THESE RAILWAYS LOOK LIKE ? I have already stated that there is a a set of longitudinal steel beams supported on A-frames, which are transverse beams supported on legs that splay outwards to provide lateral stability. However, we must look at these components in some detail, because their design is governed as much by the construction methodology as by the required load-bearing capacity. A driver for the design of the structure is that most of the erection will be done in remote areas, where there may not even be road surfaces sufficiently strong enough or wide enough to transport the materials. This implies that the railway itself will be the supply line carrying components for prefabricated construction at the railhead. The prefabrication elements will need to have appropriate dimensions and weight to be carried on specially designed railway wagons. The A-frame legs and the longitudinal beams will be of lattice construction to provide the maximum strength from a minimal amount of steel. Between the longitudinal beams will be steel troughs (one for each direction) and, if desired, space could be left between them for a dedicated VFT line, such as a Maglev. Rails will be attached to the floor of the trough for regular trains. MonoCabs and similar vehicles equipped with rubber-tyred wheels will straddle the rails and ride on the floor of the trough. They will be held in transverse location by outriggers with wheels at their outer end, which will roll along the vertical walls of the trough. This geometry raises some issues for the MonoCab style of vehicle whenever crossovers and junctions are encountered. However, there are a number of solutions that could be adopted. The outriggers could be extensible in a concertina fashion and be attached at the corners of the vehicle where they would be able to swing forwards and back. This would allow the forward-reaching outriggers to land on the branching trough before the rearward ones became detached from the main trough. Another possibility would be to place the wheels above the outrigger and, where necessary have an L-shaped plate attached to the trough wall and hanging over the wheel. The outrigger could then become bidirectional, pushing or pulling against the trough wall as required. Finally, the stabilising wheels could be located under the carriage, riding in a channel. When it becomes necessary for the vehicle to cross the track, one of the two sets of stabilising wheels would be raised up to cross the track, followed by the second set after the first had descended into the channel again on the other side of the track. In the region of the junction, the surface upon which the vehicle rides would be raised up to the same level as the track, which at that point would resemble a tram track. Platforms at stations would be located along the outer edges of the track, with ramps or stairs leading down to the station building, which would be located below the tracks. City terminals often have very high ceilings or glazed roofs, so it should be possible for elevated railways to reach and use such stations with very little impact on pre-existing infrastructure and services. Opportunities exist for the provision of ducts housing water pipes, power cables, telephone cables, optical fibre cables and other services, which would improve the economics of constructing the railways significantly. It might even be possible to use the trough as a water catchment for agricultural use or fire fighting. 2. HOW WILL THESE RAILWAYS BE BUILT ? The first railways were built in England, from one pre-existing town to another, in order to transport passengers and goods. In other, less well-developed places, the general model was to set out from a starting point and head towards a target finishing point. Thus, American railways were, in the beginning at least, intended to connect the Pacific and Atlantic coasts. In East Africa, the first railway was built to connect the East Coast to Lake Victoria. In Europe, many railways were originally designed to connect capital cities directly to border points, where they could, in turn, connect up to railways in an adjoining country. A most interesting book called “Blood, Iron and Gold: How Railways Transformed The World” by Christian Wolmar describes the policies and drivers which led to the construction of these seminal railway systems. Where there were no existing local roads to service the construction process, very often, a road alongside the track was built for the purpose and then was either connected into the existing or future road system, or was simply retained for maintenance purposes. In the USA, Australia and East Africa (I worked on railway design and construction in the latter two), the land consisted almost entirely of broad open spaces. Such settlements as there were existed to extract or grow marketable food and materials. The usual modes of transport were horses and carts or camel trains, travelling cross-country directly from point to point. There were few, if any, roads as we would understand them. When the decisions were made to build the railways, heavy reliance was placed upon the information provided by explorers, hunters and the like. Ownership of the land by local tribes was, in general, ignored. Once the overarching route had been sketched in, construction would commence from the starting point. Detailed surveying would be carried out ahead of the advancing railhead. In general, because the countryside was considered to be undeveloped, large-scale earthworks and structures were rejected in favour of diversions. Looking at some of these older railway tracks on (say) Google Earth, it is amazing to see great looping curves alternating with straight sections stretching for many kilometres. Where the impediments were really colossal (the Rift Valley in Kenya, for instance), structures such as loops (where the track would curve around in a circle, gaining height, eventually crossing itself with a bridge) or switchbacks (where the track would zig-zag up an escarpment, with trains reversing at each extremity) would be employed to gain height. The general thesis behind this blog is that food production and population absorption may, in the future, require the construction of settlements in remote areas to take advantage of relatively limited and heavily localised resources. These settlements will in effect be oases in a relatively barren landscape, with the railway being, in the initial stages, at least, the prime and possibly only form of transport connection to the outside world. One can argue that the required developmental model is similar to that used in the three continents mentioned earlier. However, there is one important difference. In those places, rural and commercial development followed in fairly short order, so that after the first extensions into the hinterland, a wide range of resources such as construction equipment, housing, support services, etc. became available. In the current Australian context, the railway lines will be connecting a lot of dots on the map and construction will be almost totally reliant on personnel, materials and equipment carried to the railhead on the railway itself. Within the construction zone, both the up and down lines will need to be used bidirectionally. The former will carry equipment, such as cranes, tractors, concrete pumps and like. The latter will carry construction materials, personnel and supplies. Trains will need to have a control cabin at each end and will, in general, travel backwards and forwards on the same line during the construction phase (though it may be feasible to construct two-way crossovers at a few convenient points). In the most general case, foundations will consist of reinforced or prestressed concrete slabs spanning between the grounding points of the A-frame legs. In soft ground, the slabs may need to be supported on Frankipiles. Where the railway is crossing a flood-plain, some of these Frankipiles on the downstream side may need to be angled away from the vertical to provide lateral support against flooding. It may be necessary to construct intermediate foundations to support temporary framing which in turn will support deck elements as they are advanced towards the next permanent A-frame. Alternatively, it may be possible to suspend the beams from a horizontal crane with substantial kentledge at the rear. Fabrication of the deck from the shipped-in components will be carried out on a deck sitting on wagons side-by-side on each line. As each section (approximating in length to the distance between two adjacent temporary or permanent A-frames) is completed, it is rolled forward until it rests on the leading A-frame. The next section of deck will be constructed by extending the previously completed section backwards and then rolling the entire structure forwards. Once a span between two permanent A-frames is completed, the assembly deck can be rolled forward. One of the greatest problems affecting rail construction in Australia is the very large variation in temperature. In Central Australia, one can encounter a temperature range in the order of 15 to 50 degrees Celsius. When railway lines are subjected to variations of this order they expand and contract linearly. Because they are pinned down to the ground, these movements cannot take place and this causes the stresses in the rails to rise. In effect they behave like columns. If columns are too thin, they tend to buckle sideways under the load. Except in cases where the railway line components have all been expressly designed to handle extreme temperature ranges (as in some of the ore-carrying lines in Northern Australia, for instance, it is quite common (in older lines, at least) to see tracks which have buckled sideways or lifted clean off the ground because the sleepers were not adequately anchored into the ground or were not strong enough and splintered under the load. In general terms, the lattice frame structure and the trough deck will provide a sufficient lateral dimension to ensure that buckling does not take place, but the corollary is that the connections between components must be strong enough to ensure that no separation takes place and the spatial geometry remains intact. I must emphasise that the structures I have described here are speculative and not prescriptive. Other designs appropriate to the terrain and the construction process are entirely possible. My main intention is to demonstrate that there is at least one modus operandi available and the concept does not deserve to be rejected for lack of viability. 3. WHY ADOPT THE ABOVE-GROUND DESIGN ? 3.1. Reduced Impact On Ground Conditions. It may be necessary to drive the line through a mountain range via a cutting. The amount of excavation required for the elevated railway is only a fraction of that required for the same location at ground level. To prove this point, imagine that the cutting cross-section is an inverted triangle. Assume also that the height of the elevated track is midway between ground level and the highest point of the range. If one draws a line through the triangle at a point half-way between the top and the bottom, one can see that the amount of excavation required for the smaller triangle (the cross-section required for the elevated railway) is only one-quarter that of the larger triangle. There are many salt flats and shallow lakes in Central Australia. Where it is necessary for a train to cross such features, the need for drainage to expose the underlying ground level can totally compromise the value of the feature as an aid to biodiversity. By contrast, the above-ground structure can simply be erected upon piled foundations with very little effect on the local wildlife. Similar considerations apply to routes which cross river valleys and flood-plains. An elevated railway can keep functioning (provided the water level does not spill over the track, of course!) in situations where conventional railways are not able to operate and, worse still, the track is at risk of significant damage, necessitating expensive repairs after the floods have receded. 3.2. Interaction With The Economy. One can argue that over a single kilometre of flat ground, conventional track is cheaper than the elevated version. However, this simplistic view fails to take into account a number of ancillary benefits which elevated railways confer on the economy. I worked as a civil/structural engineer on a variety of projects until the early 1980s, after which I moved over into the IT world. In my earlier career, the standard method of paying the design consultants (who would also supervise the construction) was through a fee which was a percentage of the completed project (usually 6%). This was enough, not only to complete the finalised design, but also to spend time examining alternatives and looking in detail at any advanced technological features about which there was not much field experience reported. These opportunities disappeared with the outsourcing of projects, where competitive tendering forced design consortiums to produce, at first attempt, a design which would cost the least to build or if there is any technical uncertainty, could attract contract arangements which would pay out cost over-runs. In other words, there was no margin for error. This model was further complicated by the introduction of public/private partnerships where the complex financial arrangements allowed organisations such as the notorious Babcock and Brown to expand their income hugely by creating hierarchies of companies, each of which paid management fees to the next company up the chain. The end result is that, in the main, we are paying far too much for our infrastructure, for the purely political reason that governments prefer to keep such projects off their books. The beauty of the elevated railway design discussed here is that most of its features are constant from project to project. Any difficulties encountered on a project or any new ideas tried out become part of the pool of knowledge and will be reflected in the more competitive prices of future contracts. Contractors will be awarded projects directly from the government on the basis of their efficiency, experience and ingenuity with none of the risks exposed in Victoria’s hugely expensive desalination plant (to name but one PPP disaster). Because the concept is so straightforward, and the function of the railway is to assist in the development of new outback areas (initiatives which will hopefully have been rigorously assessed), projects of this kind will be attractive to investors and governments should be able to issue bonds to cover the cost at a very attractive rate. One of the most profound impacts on the economy is that the railway will consume a very large amount of steel. Currently, the manufacturing side of the steel industry is not in very good shape, partly because of the high value of the Australian dollar and partly because of government-subsidised steel activities in other countries, particularly China. These circumstances make it possible for raw iron ore to be shipped to China, turned into iron, used for the manufacture of structural components or household equipment and shipped back to Australia at prices that our steel manufacturing industry cannot match. If it is specified that only Australian steel can be used in railway construction, this should provide a substantial boost to the local industry. Furthermore, as the components of the above-ground structure are heavily standardised, contracts for manufacture and storage can be awarded to many different companies around Australia, ensuring that any benefits are uniformly distributed. Finally, as steel is a recyclable material, an upgrade or a dismantiling of a line offers materials that can be re-used on other projects or, at a minimum, melted down and cast into other usable items. There are many places in the world which have arid terrains similar to those in Australia. Interesting possibilities exist, therefore, for the sale of the technology and materials or for their inclusion in aid programmes. 3.3. Interaction With Other Commercial and Personal Activities. When an on-ground railway line passes through agricultural land, significant access problems are created and these are exacerbated as the average speed of services increases. Crossing points such as bridges and level crossings must be created. The former are expensive to build and are therefore likely to be inconvenient distances apart, requiring significant detours (to access remote parts of a farm, for instance). The latter are simply too dangerous to be allowed on a high-speed line, unless electronically controlled barriers are installed. These too are very expensive in remote areas, where electricity supplies may be sparse. Overhead railways, on the other hand, preserve the current farm operating procedures to the maximum extent possible. There are some bonuses, too. Firstly, there is little, if any, loss of land to a railway reservation. Secondly, the A-frame columns could support cladding, creating glass-houses, shelters for poultry (where a battery system can be modified to allow periodic access to the adjacent pasture for the poultry) or simply storage for equipment, materials and crops. These possibilities can significantly enhance the farming activities. Noting that the railway services will, in the main, be electronically controlled from terminal points or stations, it is feasible to set up daily time zones where fast passenger and goods services are despatched after which the lines are available for privately-hired car-carrying Monocabs and other passenger and commercial vehicles to follow them. They will slowly fall behind the fast trains and the trains despatched in the next time-zone will slowly catch them up, but the remote controls will ensure that collisions will not occur in the event of any unscheduled stoppage. Hence, there are substantial opportunities for privately- and publicly-owned services to share the lines. This blog is intended to provide possible models for the management and development of Australia and its resources at some future time when population and food production pressures have reached very high levels and we need to maximise the return on every agricultural and manufacturing capability we have. However, if we wait until this necessity really bears down on us heavily, it may be too late to derive the maximum benefit from them, because time will still need to be spent on identifying the optimal models, setting up manufacturing lines and so forth. It would seem prudent, therefore, to prepare some alternative designs and do some testing before then, so that when the time comes, we can immediately undertake every task that the situation calls for. So far as the overhead railways are concerned, we may possibly have some immediate opportunities for designing, testing and constructing some trial sections of overhead railroad. A few days ago, there were several articles in the local press, discussing the proposed introduction of B-triple vehicles on interstate highways. In general, people were very critical of this notion. A lot of road improvements would be required, safety of car passengers could be compromised, driving the large vehicles could put significant pressures on driver health and so forth. In parallel with these arguments, there were complaints from people living in remote areas that commercial traffic was damaging their roads and repair work was not keeping up with their needs. The alternative that everyone favoured, in principle at least, was a return to railway transport. However, nearly all of the main lines still in service were in poor condition, so that speed restrictions were the norm, rather than the exception, while the branch lines, which had been closed for many years, had deteriorated to the point they were not worth refurbishing. Unfortunately, no one was prepared to spend the required funds on upgrades! It seems to me that there are a couple of opportunities, here. Firstly, a rural branch line (or part of one) could be reconstructed as an elevated railway. Then, if that experiment was successful, a section of a main line (preferably a low-lying one where substantial repairs due to the damage to ballast and the occurrence of mud-holes are an immediate requirement) could be replaced by a section of overhead railway. A major advantage in this case is that little, if any, railway closure would be required. Furthermore, as most main lines in Australia still employ ballast as a base, a move to so-called Very Fast Trains, or VFTs will require substantial upgrade work, which will not be necessary on the elevated section. This will already be sufficiently stable, while the trough deck construction will allow a wide range of superelevation, if carriages are fitted with retractable outriggers, which can bear on the trough walls to maintain balance. Aeroplanes have higher speeds in the air, but take-off and landing, embarkation and disembarkation and the processing of passengers and goods largely negate this advantage. Internationally, airline travel still has some advantage, but if some remarkable ideas such as the installation of a maglev train running in a tunnel under the sea ever came to fruition, this situation could change significantly. Local traffic in rural areas and cities rely on a complex network of roads for travel and obviously this cannot be matched by railways. However, many long-distance journeys between settlements are made by car simply to have the convenience of driving around the destination without additional expense. This problem can be solved simply by providing facilities for carrying the car on the train. When we moved from Perth to Melbourne, we travelled on the Indian Pacific for most of the way and our car was simply driven onto a flat wagon and secured. The Monocab designer is also thinking about adding a flat deck for a car to the rear of his vehicles. I have conceived the idea of a wagon with a box like a shipping container which sits on a wagon but can be rotated through 90 degrees, so that the car can be driven straight onto it without any special equipment. At the other end of the box is a passenger compartment equipped with toilet, refrigerator and a microwave. It may also be possible to include a corridor so that these wagons may be included in the body of the train with the travellers sitting in a nearby compartment. This version would be useful if overnight travel is required. An interesting aspect which has only come up in the exploration of the overhead railway concept is the multiple kinds of traffic which could be accommodated. The normal fast train, driven by a variety of (mostly) renewable resources has been joined by the Monocab and now by the Maglev. If the floor of the troughs was properly designed, it might even be possible to allow appropriately equipped road vehicles to drive along them at times of low-intensity rail traffic. I believe that these times offer some exciting and interesting possibilities for the railway. I am just a little sad that I am now retired and not able to take an active role in its regeneration. Still, even an observer might have some ideas to contribute! While looking at what is involved in estimating the maximum possible population for Australia, I, as an engineer, have naturally been drawn to the provision of the physical requirements, such as services, infrastructure, food production and the like. However, my attention has been drawn to another feature of remote village life, which is the importance of community participation (for want of a better word). In a recent post at a blog site called The Conversation, the writer discussed the surprisingly positive aspects of village life in India, where the standards of living (as we would understand them) are very low. He found that there were a lot of offsetting features which made day-to-day life a lot more rewarding than one would have thought. Now, I am not suggesting that we should adopt the local attitudes and customs that were identified in the post. However, I do now believe that we should be looking at what our remote communities do find rewarding and when we develop new communities and reinvigorate old ones, we must try and provide appropriate support for all those features, physical and mental, which would make rural living in Australia worthwhile in the much more restricted economic landscape which will almost certainly be experienced in the future. The post I am referring to can be found here. As it happens, I do have some experience of the old-style village life which could still be a model for the new rural communities. As a small boy, I was evacuated during World War II to live in a small village near the Scottish border while my parents were engaged on war work. I lived with my two maternal grandparents, with an aunt further up the same street and a paternal grandmother and uncle and aunt just round the corner. A few miles away, another uncle and aunt ran a large farm, with a row of labourer’s cottages just round the corner from the farmhouse. My grandfather was a retired bank manager who, as he opined “could still tell to the pound how much he could lend to anyone in the village”. My point in mentioning these relationships is that everyone knew and were friendly with a lot of people, and because there so many interactions on the street or in house calls, I got to know them too and, more importantly, they got to know me. For a small boy, whose parents are elsewhere, just to be greeted frequently and asked how well things are going for me, was an immensely comforting feeling. I attended the local government primary school, which was loosely associated with the nearby Anglican church, but most of my really close friends were fellow evacuees, for obvious reasons. There was a Catholic primary school at the other end of the main street and relations between the schools were fiecely competitive, though the only time they ever degenerated into open warfare was when the snow was a foot deep on the ground and the urge to throw snowballs became irresistible. I was very well taught at my school and eventually, I scored the highest marks in the county of Northumberland for the 11+ examination (the door to a good secondary education), while my best friend and fellow evacuee came second. We were both offered scholarships to some of the finest grammar schools in the area. Now the point of this story is not to blow my own trumpet (frankly I was rather astonished to have done so well) but rather to describe the effect it had on the village. We were absolute heroes and for days we were stopped in the street by people who wished to congratulate us (and even buy us an ice-cream!). Our success was taken to be a reflection on the village itself and the sense of pride in our achievement was palpable. It is this feeling of togetherness which makes remote village life viable and any planning for upgrading an existing community or creating a new one must ensure that whatever resources needed to promote this feeling must be made available. The quintessential blogger seems to be either a professional writer/journalist or an amateur with lots of time available (almost on a daily basis) to set down their thoughts and share them with the world. Unfortunately, as any viewer of this blog will realise, this is not me! If I must wear a descriptive cap, then I might claim to be an essayist. However, I will chip in now and again if something interesting pops up which I am not yet ready to put into a more extended post, or if someone has been kind enough to comment on one of my posts. I have not made a recent contribution, partly because I have been involved in various activities related to environmental and planning issues (most notably, trying to get Heritage status accorded to an open-air stage with a graceful hyperbolic paraboloid roof close to where I live) and partly because reviewing the many public submissions to a Government sustainable population strategy issues paper has proved to be a surprisingly complex exercise. Anyway, that will be my Next Big Thing. Today, I will mention some matters of interest which have cropped up and deserve a little attention. In my initial scan of the submissions, I came across an interesting specification for a monorail model (the MonoCab) which I believed could usefully serve the many small communities which were postulated in my sustainable population model. This was discussed and relevant links provided in my previous post (The Sustainable Population Strategy 1). Since then, a gentleman called Philip Wong, commenting on another post (Infrastructure 2. Modes of Access), drew my attention to another interesting form of monorail – the evacuated tube transport system. In this design, a large tube is constructed above ground and supported on columns (or possibly A-frames, which are more likely to withstand the lateral forces due to the extreme flooding that we have experienced in various parts of Australia recently). The air is sucked out of the tube, creating a vacuum. Vehicles of various types and sizes can travel through the tube, powered by electricity. The key point is that the removal of the air, which in other circumstances provides a substantial amount of drag, reduces the amount of power required to drive the vehicles. Philip postulates that speeds of up to 1,000 km/hr are feasible, though I am not sure that I would like to experience the acceleration and deceleration from such speeds. Also, I would like to know about the quantum and characteristics of any noise generated. However, there could be a great role for remotely-controlled goods trains. During the floods which I mentioned earlier, a lot of rail and road infrastructure was damaged. The floods were succeeded by a record harvest, but farmers were unable to take advantage of it, because of transportation difficulties. Imagine if we could close down a vacuum-tube line to normal traffic for, say, 24 hours and then send one grain-laden train after another down it at full speed. The potential flexibility of these kinds of rail transport is quite breathtaking. It might even be possible to design vehicles that could travel on both systems. Imagine travelling from station to station picking up ones friends in various rural settlements, then once you have arrived at your regional hub – Woosh! You are getting out of the train in your capital city in less than an hour! Although a relatively small proportion of my career was actually spent designing and building railways (not counting the years as a small boy when I designed many model railway layouts), I still have a huge affection for those days – even those spent in a remote African game park, where my dear wife got a nasty dose of malaria and elephants used to scratch their behinds on the gable ends of our prefab house! I am totally convinced that rail transport has a pivotal role in the future well-being of Australia and I would now like to draw your attention to an article written by Paul Cleary in The Australian on February 11 this year. It was entitled “Reforms Must Run Faster”. Here are a few quotations from the article. “Transport and Infrastructure Minister Anthony Albanese has become a passionate advocate of investing in the rail system to reduce business costs and boasts funding of a modest $3.4bn under the economic stimulus plan to make the national system work more efficiently. But that investment is modest when compared with the $16bn spent on school halls and canteens. As Albanese argues, a single train can take 100 semi-trailers off the road, and yet major Companies such as Woolworths still run about 160 B-double semi-trailers from Melbourne to Brisbane via Sydney. The focus on the Brisbane to Melbourne freight line involves new signalling systems and the removal of sharp bends. The investment should allow the Australian Rail Track Corporation to shave 11 hours off the route, he says”. “The faster rate of road freight charge reflects the higher degree of energy intensity compared with rail. Ian McGowan, a senior industry analyst with IBISWorld, a consulting firm, says rail uses one third the amount of fuel compared with road for each tonne that it transports”. I have deliberately reproduced quite substantial parts of the article, because I wanted to keep the focus on the technical and economic aspects and not be distracted by the references to the attitudes and behaviour of politicians and powerful industry groups. However, the entire article can be read here. In another recent post (Urban Landscape For A New Era) I suggested that we could build houses with substantial steel frames, which could be easily modified for different uses. If we were to adopt this idea and we were to be build a monorail network on the lines I have discussed here, I would suggest that any construction contracts should specify the use of Australian-made steel. The Australian steel industry is in a parlous position at the moment because the iron ore we ship to China and other countries is being imported back to Australia at prices we cannot match. In a true free-market economy, one would have to say “so what”, but the trouble is; we do not know whether the steel articles we are importing are manufactured under the same free-market rules, or whether they are subsidised to reduce the amounts payable in Australia by overseas mining giants (and others). Already, we have seen substantial overseas investments in Australian agribusiness and real estate and now we read (“Mining’s Small Change”, in The Age on 18/02/2012) that flaws in the mining tax legislation will allow tax avoidance on the grand scale. We really must have an open discussion on a comprehensive future vision for Australia. The current political operating mode and the capture of many media resources by business and political interests stifle open debate and I look at my gorgeous grandchildren and think about their future with some dread. Whoops! Once personal feelings intrude on what is meant to be an intellectual and practical discussion, it is time to close the file and turn off the computer. Well, for another day. In May, 2011, the Australian Government released a paper entitled “Sustainable Australia – Sustainable Communities” and subtitled “A Sustainable Population Strategy For Australia”. This was followed by “Sustainable Australia – Sustainable Communities: An Overview”, reports from three panels of experts and more than two hundred published contributions from a wide variety of individuals, corporations, interest groups, local government and others. Over the next few weeks, I will be trawling through all of this material to try and identify (a) matters where the project I am proposing could make a significant contribution and (b) whether there are additions or modifications I can make to my ideas that would enhance their usefulness or relevance. I should make the point that my blog is not about espousing any particular philosophical, social or economic policy, but only suggests tools that would ensure that any policy directives were based on the best information available. I have divided the external submissions into categories in accordance with the role of the authors in the community. For instance, we have private individuals, industry organisations, local government and so forth. This meant taking at least a cursory look at all of the papers presented and there were a few surprises. Among the individual contributions I had expected to find a lot of people simply putting forward an opinion (particularly in the area of immigration ! ), but I found many offerings, even among these, which actually raised issues well worhy of investigation, so I will have to make quite a big effort to categorise the issues properly, so that they ca n be discussed in an appropriate context. Along the way, I did find a few gems, which I will discuss as they arise, because I think they are important or at least interesting. Here is one which appeals to me particularly as an ex-railway engineer. It describes a monorail system carrying a variety of vehicles including private passengers (the size of a motor car, possibly extended to carry a container holding the passengers’ own motor car), public passengers (a railcar the size of a railway carriage) and sundry commercial vehicles. The designer, David Whittaker, views his creation as either a suburban network or as a city-to-city fast train service or connecting remote communities to cities. I can visualise a more extensive use for this technology, connecting settlements to each other and to local hubs. In earlier posts, I have discussed Bill McKibben’s concepts of a highly distributed population living in small, village-like communities, to make maximum use of relatively small parcels of land for food production. For this to work, the sense of isolation must be mitigated by fast, robust transport systems and a powerful broadband network. This is where David’s concepts may have a substantial role to play. Here are a few of the useful features which make it an attractive proposition. It is above ground, with the rails being carried on columns. Railways in general can handle only very flat gradients and large-radius curves. This requires substantial earthworks in the form of cuttings and embankments. All a monorail requires is space for a foundation slab, perhaps sitting on piles when in an area of soft ground. Variations in the terrain can be accommodated simply by increasing or decreasing the height of the columns. No land need be purchased and the only requirement is temporary access for construction and maintenance. The railway, when traversing agricultural land, will result in little or no loss of productive land. On the contrary, the farmer may find the monorail a readily accessible form of transport for produce of appropriate kinds. As pointed out by David, the track could act as a carrier for the NBN fibre network. In addition to the construction savings for the NBN project, access to the network by the vehicles will result in more effective and safer control mechanisms (important in a remote rural setting). One of the problems with remote communities in Australia (largely because of the rugged landscape) is easy access to education and health services. This can be seen particularly in indigenous communities in the north of the country. A fast service of the kind envisaged would allow the operation of quite modest hospital units and boarding schools serving quite substantial areas. (As an aside, the Masai tribes in East Africa, where I once worked, were very intent on not compromising their nomadic lifestyle and had schools and hospitals built around the fringes of their tribal lands, so the concept is a credible one, dependent only on the economics). It is file 0271.pdf in a very long list. A visit to the web site www.monocab.com should also prove very rewarding.